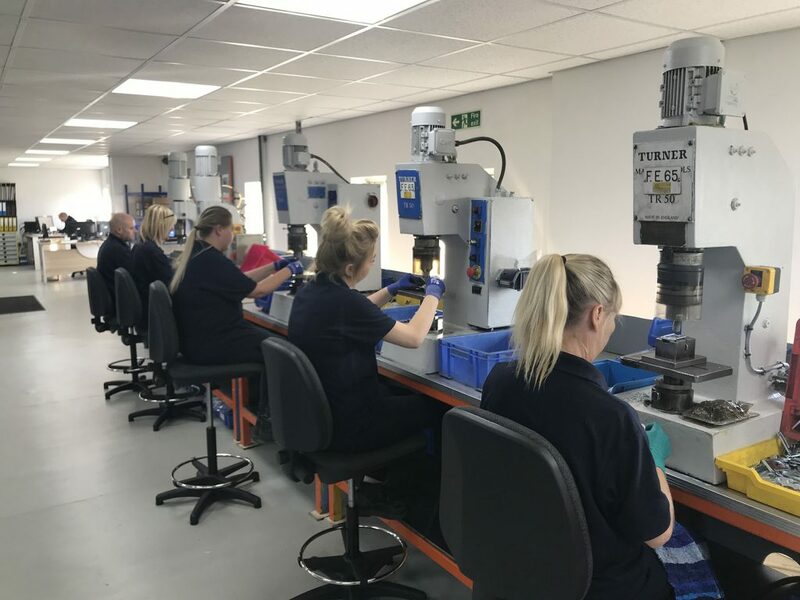 Penn Elcom, leading global manufacturer of 19-inch racking and flight case hardware, has expanded the Latch producing line its Washington, Tyne & Wear UK base, adding three new jobs, and 10 new machines as part of a £50,000 investment to update and expand its production of latching mechanisms. 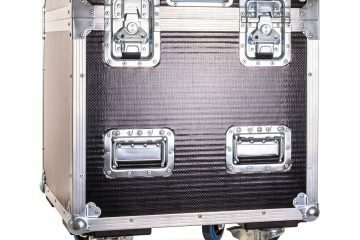 Nearly everything needs a latch of some sort, and multiple types and styles of Penn latches are made here – for a range of flightcase and 19-inch racking products used in all sectors of the entertainment, professional AV and IT industries. 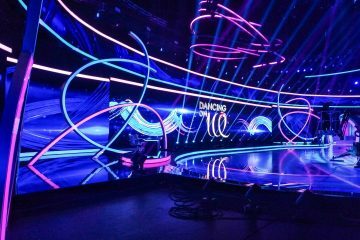 This includes anything from technical rental company equipment flight cases to installed racking systems housing amplifiers, servers and other devices. The investment and reorganisation of the Latch Line took just 5 months and will boost capacity by 30% to over 2 million latching parts per year. It has been overseen by Penn Washington production manager Steve Langdon. The Latches are made available worldwide via Penn Elcom’s international distribution network which covers all continents and countries.Sixteen skilled people are now dedicated to the latch production element of Penn’s UK manufacturing operation, producing a variety of latches. The machinery itself comprises a mix of old and new bifurcated rivet machines which include some that are pedal operated, fully guarded and yield approximately 120 finished parts per hour. The new machines can all run at the same speed, and assorted different parts are constantly being produced on the line utilising different settings and speeds, so the whole process is ultimately flexibility. 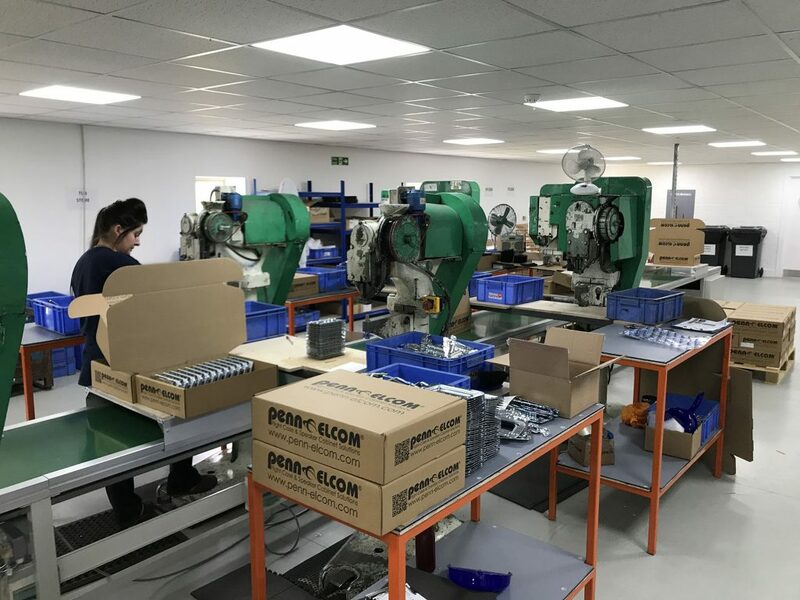 The main difference between this and the previous set up is that the operators are fed components, and their assembled parts are now placed onto a conveyor system to be inspected and packed at the end of the line. A combination of this overall process optimisation and the introduction of the new machinery allows increased productivity and less machine down-time. 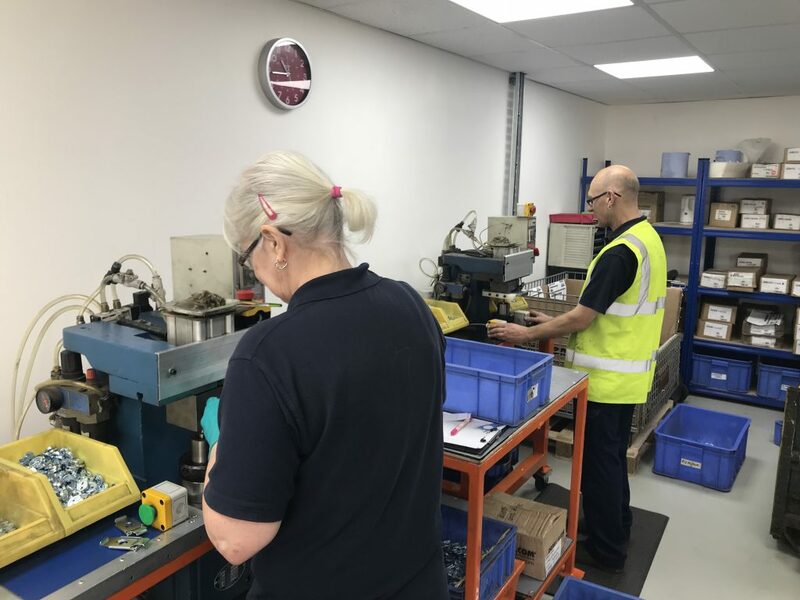 Steve explained that all the staff working on the Latch Line were integral to planning this upgrade from the outset, and were involved in every aspect from machinery layout, seating, room temperatures and working space. As a result, they are now enjoying a fully climate-controlled environment, which is much cleaner and quieter than before. 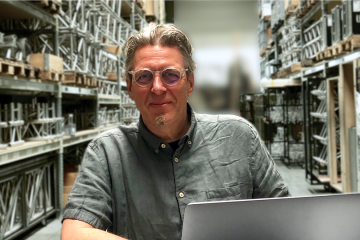 “It has been a fantastic project” stated Steve, “our goal was to create a pleasant, modern working space for employees that we could also showcase to our customers as a well-planned working concept where the passion and dedication that goes into manufacturing Penn products can be experienced first-hand”. The space is evenly illuminated with daylight colour temperature LED fixtures to ensure the best lux levels and that the highest quality standards of zinc plating can be attained as well as being safe for all the employees. The AC and soundproofing further enhance and help control the ambience in all the working areas. Staff have personalised toilet facilities, nearby rest break areas and easy access to free chilled, filtered water. “We believe these facilities have increased staff engagement, morale and productivity” commented Steve, adding that by maintaining this style of working environment and level of investment in the site, Penn Elcom is intending to continue the fast-growing trend of being an employer ‘of choice’ in the local area. This is in addition to “constantly improving our staff retention and appeal in attracting the new and diverse talents we need to remain dynamic, in-touch and accessible”.